Note: The vulnerability described here has been patched by Microsoft in October 2013 security update. Earlier this year, Microsoft announced several security bounty programs one of which was a bounty program for bugs in Internet Explorer 11. I participated in this program and relatively quickly found a memory corruption bug. Although I believed the bug could be exploited for remote code execution, due to lack of time (I just became a father right before the bounty programs started so I had other preoccupations) I haven’t actually developed a working exploit at the time. However, I was interested in the difficulty of writing an exploit for the new OS and browser version so I decided to try to develop an exploit later. In this post, I’ll first describe the bug and then the development of a working exploit for it on 64-bit Windows 8.1 Preview. 1. The exploit should not rely on any plugins (so no Flash and no Java). I wanted it to work on the default installation. 2. The exploit must work on 64-bit IE and 64-bit Windows. Because 32-bit would be cheating as many exploit mitigation techniques (such as heap base randomization) aren't really effective on 32-bit OS or processes. Additionally, there aren't many 64-bit Windows exploits out there. One prior note about exploiting 64-bit Internet Explorer: In Windows 8 and 8.1, when running IE on the desktop (“old interface”) the renderer processes of IE will be 32-bit even if the main process is 64-bit. If the new (“touch screen”) interface is used everything is 64-bit. This is an interesting choice and makes the desktop version of IE less secure. 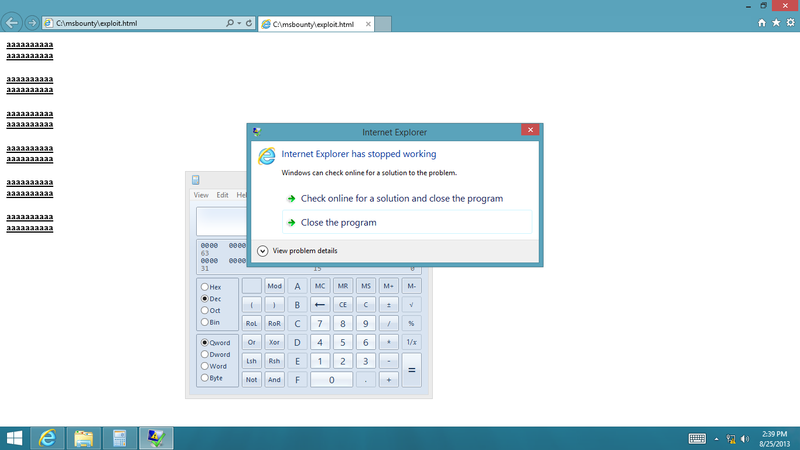 So in the default environment, the exploit shown here actually targets the touch screen interface version of IE. To force IE into using 64-bit mode on the desktop for exploit development, I forced IE to use single process mode (TabProcGrowth registry key). However note that this was used for debugging only and, if used for browsing random pages, it will make IE even less secure because it disables the IE’s sandbox mode. A minimal sample that triggers the bug is shown below. And here is the the debugger output. 00007ff8`e0c90306 488b04d0        mov     rax,qword ptr [rax+rdx*8] ds:000000a6`e1466168=???????????????? As can be seen above, IE crashes in MSHTML!Layout:ContainerBox:ContainerBox function while attempting to read uninitialized memory pointed to by rax + rdx*8. rax actually points to valid memory that contains a CFormatCache object (which looks correct given the PoC), while the value of rdx (0x0000000001ffffff) is interesting. So I looked at the code of ContainerBox:ContainerBox function to see where this value comes from and also what can be done if an attacker would control the memory at rax + 0xffffff8. 00007ffb`dac00306 488b04d0        mov     rax,qword ptr [rax+rdx*8] ds:0000007a`390257f8=???????????????? The value of rdx at the time of crash comes after several assignments from the value of ebp which is initialized to 0xFFFFFFFF near the beginning of the function (note that ebp/rbp is not used as the frame pointer here). My assumption is that the value 0xFFFFFFFF (-1) is an initial value of variable used as an index into CFormatCache. Later in the code, a pointer to a CTreeNode is obtained, a flag in the CTreeNode is examined and if it is set, the index value is copied from the CTreeNode object. However, if the flag is not set (as is the case in the PoC), the initial value is used. The value 0xFFFFFFFF is then split into two parts, upper and lower (it looks like CFormatCache is implemented as a 2D array). A value of the higher index (will be equal to 0x1ffffff) will be multiplied by 8 (size of void*), this offset is added to rax and the content at this memory location is written back to rax. Then, a value of the lower index (will be 0x7f) is multiplied with 24 (presumably the size of CCharFormat element), this offset is added to eax and the content of this memory location is written to rdx. Finally, and this is the part relevant for exploitation, a number at [rdx+0C] is taken, increased, and then written back to [rdx+0C]. For practical exploitation purposes, what happens is this: A pointer to valid memory (CFormatCache pointer) is increased by 0x0FFFFFF8 (256M) and the value at this address is treated as another pointer. Let’s call the address (CFormatCache address + 0x0FFFFFF8) P1 and the address it points to P2. The DWORD value at (P2 + BF4) will be increased by 1 (Note: BF4 is computed as 0x7F * 3 * 8 + 0x0C). If we were writing an exploit for a 32-bit process, a straightforward (though not very clean) way to exploit the bug using heap spraying would be to spray with a 32-bit number such that when BF4 is added to it, an address of something interesting (e.g. string or array length) is obtained. An “address of something interesting” could be predicted by having another heap spray consisting of “interesting objects”. Since the exploit is being written for 64-bit process with full ASLR, we won’t know or be able to guess an address of an “interesting” object. We certainly won’t be able to fill an address space of a 64-bit process and heap base will be randomized, thus making addresses of objects on the heap unpredictable. However, even in this case, heap spraying is still useful for the first part of the exploit. Note that when triggering the bug, P1 is calculated as a valid heap address increased by 0x0FFFFFF8 (256M). And if we heap spray, we are allocating memory relative to the heap base. Thus, by spraying approximately 256M of memory we can set P2 to arbitrary value. So to conclude, despite significantly larger address space in 64-bit processes and heap base randomization, heap spraying is still useful in cases where we can make a vulnerable application dereference memory at a valid heap address + a large offset. As this is a typical behavior for bounds checking vulnerabilities, it’s not altogether uncommon. Besides the bug being discussed here, the previous IE bug I wrote about exploiting here also exhibits this behavior. Although heap spraying is often avoided in modern exploits in favor of the more reliable alternatives, given a large (fixed) offset of 256M, it is pretty much required in this case. And although the offset is fixed, it’s a pretty good value as far as heap spraying goes. Not too large to cause memory exhaustion and not too small to cause major reliability issues (other than those from using heap spraying in the first place). But the problem of not being able to guess an address of an interesting object still remains, and thus the question is, what do we heap spray with? Well, instead of heap spraying with the exact values, we can spray with pointers instead. Since an offset of 0xBF4 is added to P2 before increasing the value it points to, we’ll spray with an address of some object and try to make this address + 0xBF4 point to something of interest. Another idea was to try to overwrite an address. However, note that triggering the bug would increase the address by 4GB as (assuming a qword-aligned address) we are increasing the higher dword. To control the content at this address we would need another heap spray of ~4G data and this would cause memory issues on computers with less free RAM than that. Incidentally, the computer I ran Windows 8.1 Preview VM on had only 4GB of RAM and the Windows 8.1 VM had just 2GB of RAM so I decided to drop this idea and look at alternatives. Although it’s not necessary for understanding the exploit, here’s also an example String object with explanation of some of the fields. This is indeed the value I ended up going for. To accomplish this, I got the memory aligned as seen in the image below. You might wonder why I heap sprayed with pointers to String and not an Array object. The reason for this is that the String object is much smaller (32 bytes vs. 128 bytes) so by having multiple strings close to one another and pointing to a specific one, we can better “aim” for a specific offset inside an Array object. Of course, if we have several strings close to one another, the question becomes which one to use in a heap spray. Since an Array object is 4 time the size of a String, there are four different offsets in the Array we can overwrite. By choosing randomly, in one case (with probability 1/4), we will overwrite exactly what we want. In one case, we will overwrite an address that will cause a crash on a subsequent access of the array. And in the remaining two cases, we will overwrite values that are not important and we would be able to try again by spraying with a pointer to a different string. Thus a blind guess will give success probability of 1/4 while a try/retry approach would give a probability of success of 3/4 (if you know your statistics, you might think that this number is wrong, but we can actually avoid crashes after an incorrect but non-fatal attempt by trying different strings in a descending order). An even better approach would be to disclose the string offsets by first aligning memory in a way to put something readable at an offset 0xBF4 from the String object used in the heap spray. While I have observed that this is possible, this isn’t implemented in the provided exploit code and is left as an exercise for the reader. Refer to the next section for information that could help you to achieve such alignment. Before moving on with the exploit, let’s first take some time to examine how it’s possible to heap spray in IE11 and get a correct object alignment on heap with a high reliability. These blocks are further divided into bins of 0x1000 bytes (at least for small objects). One bin will only hold objects of the same size and possibly type. So for example, in this exploit where we have String and Array objects of size 32 and 128 bytes respectively, some bins will hold only String objects (128 of them at most), while some of them will hold only Array objects (32 of them at most). When a bin is fully used, it contains only the “useful” content and no metadata. I have also observed that the objects are stored in separate 0x20000-size blocks than the user-provided content, so string and array data will be stored in different blocks than the corresponding String and Array objects, except when the data is small enough to be stored together with the object (e.g. single-character strings, small arrays like the 5-element ones in the exploit). The allocation order of objects inside a given bin is sequential. That means that, e.g. if we create three String objects in close succession and assuming no holes in any of the bins, they will be next to each other with the first one having the lowest address, followed by the second followed by the third. Knowing the address of the Array object, we can repeat the heap spray, but this time, we’ll spray with exact values (I used Array of integers to spray with the exact values). A value we are going to spray with is going to be an address of buffer capacity of an array decreased by 0xBF1. This means that that the spray value + 0xBF4 will be the address of the highest byte of the buffer capacity value. After the buffer capacity has been overwritten, we’ll be able to both read and write data past the end of the JS Array’s buffer. From here, we can quite easily get the two important elements that constitute a modern browser exploit: The ability to read arbitrary memory and to gain control over RIP. We can read arbitrary memory by scanning the memory after the Array for a String object and then overwriting the data pointer and (if we want to read larger data) size of the string. We can get control over RIP by overwriting a vtable pointer of a nearby Array object and triggering a virtual method call. While IE10 introduced Virtual Table Guard (vtguard) for some classes in mshtml.dll, jscript9.dll has no such protections. However note that, having arbitrary memory disclosure, even if vtguard was present it would be just a minor annoyance. With control over RIP and memory disclosure, we’ll want to construct a ROP chain in order to defeat DEP. As we don’t control the stack, the first thing we need is a stack pivot gadget. So, with arbitrary memory disclosure it should be easy to search for xchg rax,rsp; ret; in some executable module, right? Well, no. As it turns out, in x64, stack pivot gadgets are much less common than in x86 code. On x86, xchg eax,esp; ret; will be just 2 bytes in size, so there will be many unintended sequences like that. On x64 xchg rax,rsp; is 3 bytes which makes it much less common. Having not found it (or any other “clean” stack pivot gadgets) in mshtml.dll and jscript9.dll, I had to look for alternatives. 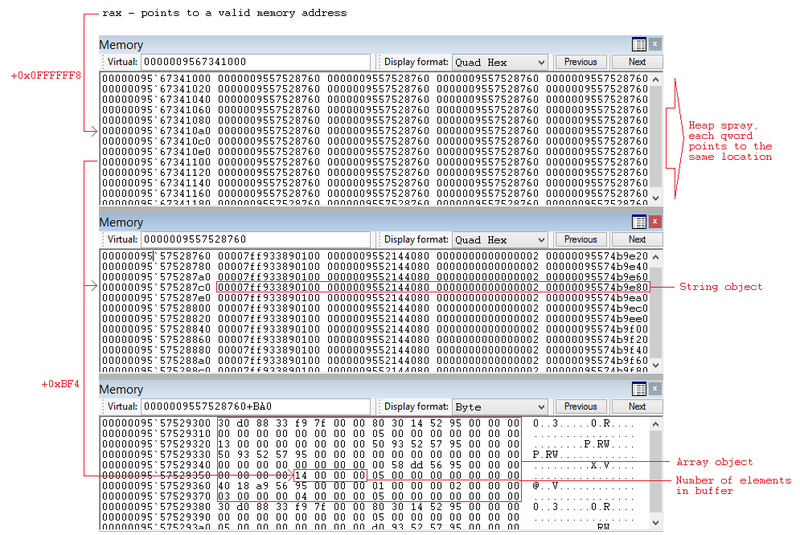 After a look at mshtml.dll I found a stack pivot sequence shown below which isn’t very clean but does the trick assuming both rax and rcx point to a readable memory (which is the case here). Note that, while there is a conditional jump in the sequence, both branches end with RET and won’t cause a crash so they both work well for our purpose. While the exploit mostly relies on jscript9 objects, an address of (larger) mshtml.dll module can be easily obtained using memory disclosure by pushing a mshtml object into a JS array object we can read and then following references from the array to mshtml object and its vtable. As it turns out the first three are really common in mshtml.dll. The forth one isn’t, however for VirtualProtect the last argument just needs to point to a writeable memory which is already the case at the time we get control over RIP, so we don’t actually have to change r9. So, we can now finally execute some x64 shellcode like SkyLined’s x64 calc shellcode that works on 64-bit Windows 7 and 8, right? Well, no. Shellcode authors usually (understandably) prefer small shellcode size over generality and save space by relying on specifics of the OS that don’t need to be true in the future versions. For example, for compatibility reasons, Windows 7 and 8 store PEB, module information structures as well as ntdll and kernel32 modules at addresses lower than 2G. This is no longer true in Windows 8.1 Preview. Also, while Windows x64 fastcall calling convention requires leaving 32 bytes of shadow space on the stack for the use of calling function, SkyLined’s win64-exec-calc-shellcode leaves just 8 bytes before calling WinExec. While this appears to work on Windows 7 and 8, on Windows 8.1 preview it will cause the command string (“calc” in this case) stored on the stack to be overwritten as it will be stored in WinExec’s shadow space. To resolve these compatibility issues I made modifications to the shellcode which I provided in the exploit. It should now work on Windows 8.1. That’s it, finally we can execute the shellcode and have thus proven arbitrary code execution. As IE is fully 64-bit only in the touch screen mode, I don’t have a cool screenshot of Windows Calculator popped over it (calc is shown on the desktop instead). But I do have a screenshot of the desktop with IE forced into a single 64-bit process. The full exploit code can be found at the end of this blog post. Although Windows 8/8.1 packs an impressive arsenal of memory corruption mitigations, memory corruption exploitation is still alive and kicking. Granted, some vulnerability classes might be more difficult to exploit, but the vulnerability presented here was the first one I found in IE11 and there are likely many more vulnerabilities that can be exploited in a similar way. The exploit also demonstrates that, under some conditions, heap spraying is still useful even in 64-bit processes. In general, while there have been a few cases where it was more difficult to write parts of the exploit on x64 than it would be on x86 (such as finding what to spray with and overwrite, finding stack pivot sequences etc. ), the difficulties wouldn't be sufficient to stop a determined attacker. Consider making compiler changes to remove all stack pivot sequences from the generated code of common modules. These are already scarce in x64 code so there shouldn't be a large performance impact. ah, the shellcode bugs were my mistakes. Windows 8 did not exist at the time of writing. Did this get a fix yet? Regarding the stack pivot, you may have luck looking for other encodings of the "xchg rax,rsp" instruction. e.g. I had luck on my target using 4e 94 c3 as my pivot gadget. Does EMET has some effect on preventing the exploitation (eg: on stack pivot) ? The most important thing in manual removal of AntiVirus Demo is to end all the related processes and then you can move to the following steps. Does this have a CVE number? Bappu Garry Sandhu's Latest Punjabi Song Review is available. Latest Punjabi Song Bappu of Garry Sandhu featuring Garry Sandhu, R.Cheema, Vikk Cheema released by Fresh Media Records on December 4, 2015 is here. Watch Bappu Punjabi Song. Its great and knowledgeable post. Thanks. I personally believe that working with wordpress means a lot for the website. The wordpress two factor authentication gives best outlook to your site ever. Thanks for sharing this information and keep updating us. This is more informatics and it really helped me to know the software Testing. Check the following links about SoftWare Testing .its really helped. If someone want to read more about that security I think this is the right place for you! Nice post. Thanks for your sharing. we are one of the best mosquito net in chennai. Good One !!! Very Informative Post !! I applaud the publication of your article on useful information. Thanks for shear it.....Download Latest Version↪►► iExplorer Registration Code...... You are doing right job. Well written and compassionate post. I find your thoughts and wisdom to be encouraging and helpful, many thanks and God bless you always! Despite the fact that Windows 8/8.1 packs an amazing weapons store of memory debasement alleviations, memory defilement abuse is as yet perfectly healthy. Without a doubt, some defenselessness classes may be progressively hard to abuse, yet the helplessness exhibited here was the first I found in IE11 and there are likely a lot more vulnerabilities that can be misused comparatively. We provide the great verity of this type of articles.. String is immutable in java. But following functionalities can be accessed in string datatypes in java. String is the most widely used class in java programming. That’s why String programs are used in java interviews to access the coding skills. What are mobile marketing and its uses? Thanks for your informative article, Your post helped me to know the future and career prospects updating your blog with such amazing article. Thanks for sharing this, keep updating Information. It is an awesome article.